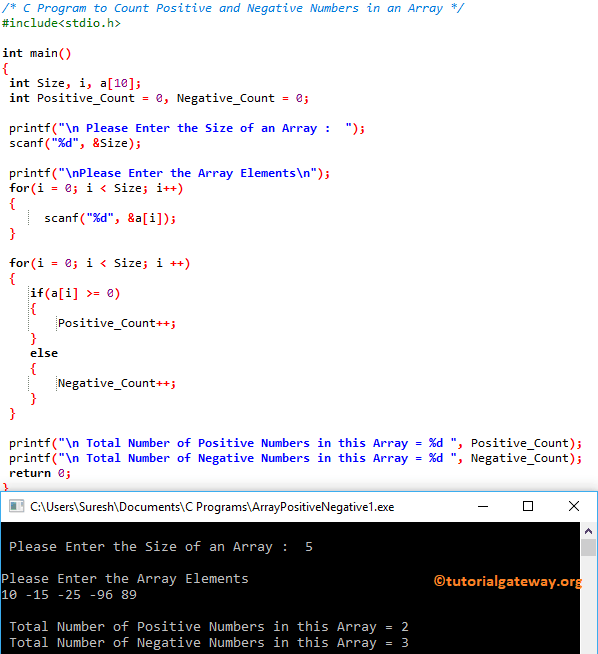 In this article, we will show you, How to write a C Program to Count Positive and Negative Numbers in an Array using For Loop, While Loop, and Functions with example. Any number that is greater than or equal to 0 is a Positive Number. If condition will check for the same. If the condition is True then it is a Positive Number, and the compiler will increment a Positive_Count. If the condition is False then it is a Negative Number, compiler will increment Negative_Count. This program is same as the first example, but we separated the logic to count positive numbers, and negative numbers using Functions.